Sai Packers and Movers offers unparalleled expertise in the office shifting arena. Sai Packers and Movers make the mammoth task of office relocation fluently. Just like domestic shifting require in depth analysis of the goods and an appropriate packing and an adequate padding facility, In the same manner corporate moving also requires a detailed overview of the office that need to relocate from one place to another. If People think shifting office is tough and impossible – you’re wrong – “we make it east and possible” Office packing services involve packing countless files, papers, cabinets, all sensitive computer equipment, desks, chairs, high-tech machinery & other innumerable office Materials. Just as in domestic moving there are so many knacks that need to be placed efficiently in a manner that they can be easily traceable at the time of unpacking. In the similar manner Corporate Shifting has to ensure that packing is done in a manner that there is the minimum loss of working hours and also that the operations get impacted in the least possible manner. Over the decades we have moved numerous small and large organizations into their new destinations ensuring zero disruptions to routine work. The Shifting process should be fast, effortless and smooth so as to easily lead the employees from the older location to the newer location with the least amount of loss of the productive hours. The kind of service offered by sai packers and movers makes sure that stringent and systematic methods are followed for reliable, smooth and safe shifting task. Companies turn to Sai Packers and Movers for peace of mind, safe in the knowledge that we have the experience and expertise necessary to make every office relocation a successful one. Sai Packers & Movers is Well Known for Superlative Local Shifting Work. 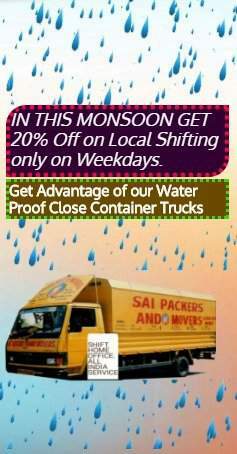 Get to Know about our Delightful Local Shifting Process..
National Shifting is full of Risk if not Done through Professional Movers. Get to Know about our Systematic Domestic Shifting Process..